The calendar below contains all the best screenwriting contests (orange), awards (blue), festivals (green), fellowships and labs (yellow) in 2019. All movie events, screenwriting competitions and film festivals can be imported to your iCloud Calendar here. Don’t forget to create a new calendar of these events (see screenshot below). 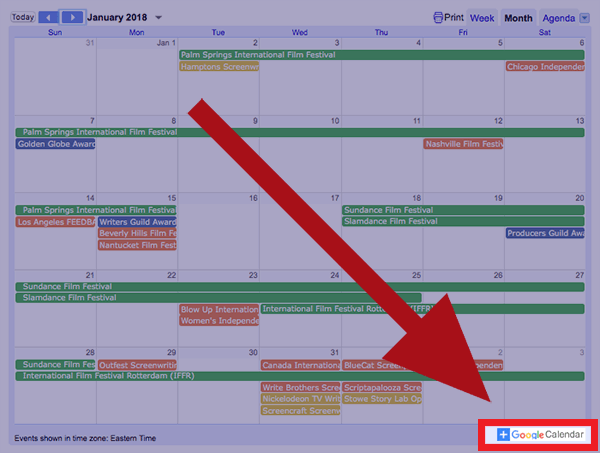 For Google Calendar users, please click on the “+ Google Calendar” icon (see graphic below) on the bottom right hand corner of the calendar above and all dates will be imported to your own Google Calendar. Any calendar additions, corrections or questions? Please email us with any great screenwriting contests, festivals, fellowships etc. you think we’ve missed out. ACTIONABLE SCRIPT COVERAGE ooh yeah! Forget vague script coverage that tells you to “ramp up the stakes in Act 2” but doesn’t tell you how. Ours is actionable, full of fresh ideas and super intensive. HANDS-ON SCREENPLAY COURSE CHECK IT OUT! Our screenwriting course demystifies theory and cuts through the “fluff” found in most script writing courses, screenwriting books and script coverage services. PRACTICAL SCREENWRITING BOOKS tell me more! Our screenwriting books on dialogue, formatting and structure focus on practical exercises and theory hacks, combining the knowledge of pro writers.